I'm gate crashing it either way! i am going to be doing a window shopping today for console, will probably visit all the 3..
Monstar, if you were rich.. you would probably get the F1 team race simulator i presume.. If you were rich, why simulate when you can just buy an existing F1 team and make yourself number 2 driver! WebHead a écrit: If you were rich, why simulate when you can just buy an existing F1 team and make yourself number 2 driver! right.. why didnt i think of that.. but no 2?? Rus-Evo a écrit: One console advantage is being able to play on the couch in comfort. I got my PC connected to my Home Cinema, so I can not only play games but type this on the couch in comfort, surf the net, watch movies / TV / F1 live - the works!! Yeh, I like the same setup. But I'd want an additional PC so that I can also do regular work at a desk. Right now I move it around if it's gonna be a long day! WebHead a écrit: Yeh, I like the same setup. But I'd want an additional PC so that I can also do regular work at a desk. Right now I move it around if it's gonna be a long day! ..... Yep Agreed - got a "normal" desk top PC in the Family Room as well ! Good on ya Rus ..... 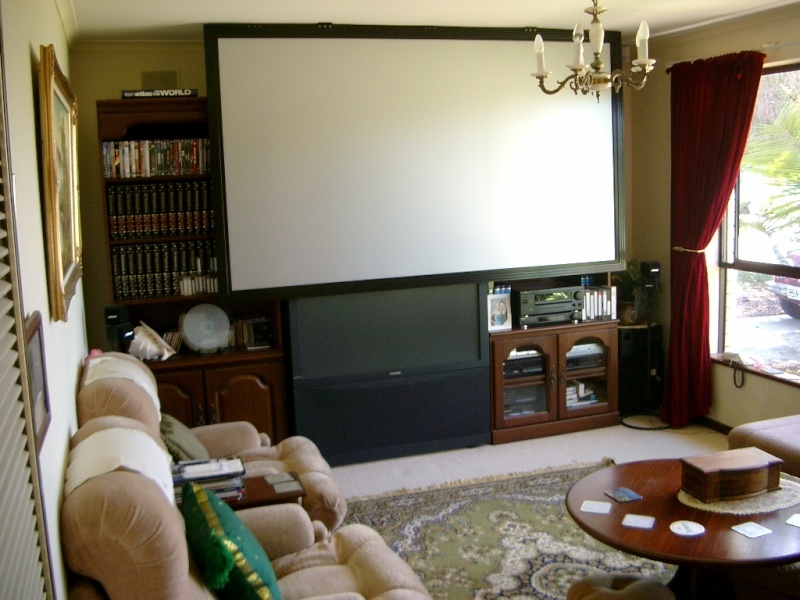 I've had the old Media Centre PC for near 4 years now - when I get serious in the lounge / home theater, I have a 104 inch screen which drops down over the 52 inch TV and I fire up the Epson 720p HD front projector and crank-up the Denon 650 watt RMS amp / sub woofer set-up. Even though it is not a Full HD 1080 format projector, on HD sources, my son tells me it still looks better than "his" 7 Cinemas (in a Westfield shopping complex) where he works as a Projectionist - I can't wait till mine dies and I can then get a new 1080 Full HD job - not that I'm complaining !! How long does your globe last Schuy? Good on ya Rus ..... 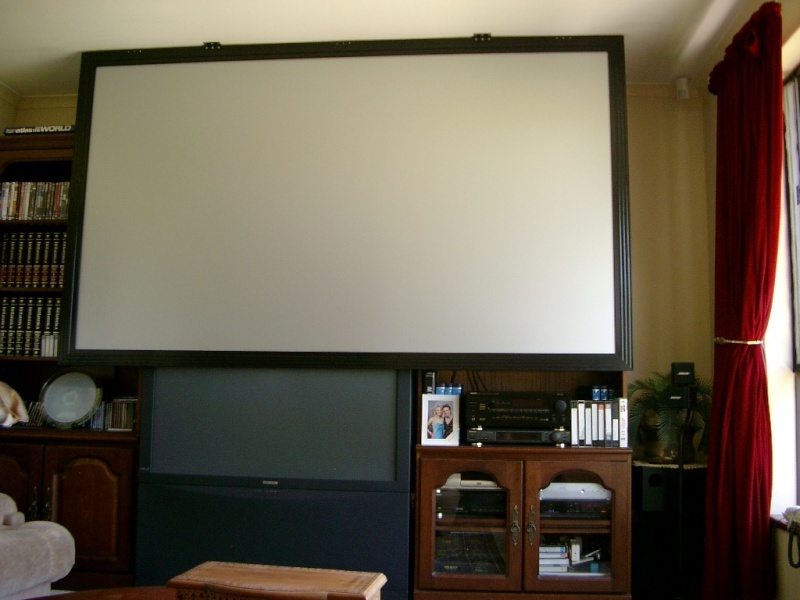 I've had the old Media Centre PC for near 4 years now - when I get serious in the lounge / home theater, I have a 104 inch screen which drops down over the 52 inch TV and I fire up the Epson 720p HD front projector with crank-up the Denon 650 watt RMS amp / sub woofer set-up. Nice. You need a dark room for that projector? WebHead a écrit: How long does your globe last Schuy? I think the globes are rated at about 2,000 to 3,000 hours - I've had my current (2nd) PJ since new now for about 30 months and it's got about 1850 hours use. A new globe will set me back about $AU400 when it finally snuffs it - a bit of expense but well worth it when one enjoys life-like images of nearly 3 metres wide !! Rus-Evo: Nice. You need a dark room for that projector? Well, just like in a picture theatre, near darkness is best - The Epson can go up to 1600 Lumens in high brightness mode ( called "Dynamic" mode) - I was watching it the other day in full daylight (morning sun) and I just had the curtains closed it was still pretty good BUT it has a much better picture - better or equal to Cinema quality, in a dark room for sure. Thats the main issue with have a projector. If your spending that much doh, you really want more function. Although a screen in excess of 100 inches is cool. Was it expensive and does it have motion blur? I want to get this when it is released. Then i can watch movies on a screen anywhere i want . That will be cool when the technology is perfected. It needs more lumens as its a bit faint. Gosh I can imagine in the future a media phone that is like a media PC, and which you listen to on surround sound headphones!!! One can always wait for technology to get better and better BUT you can be waiting for the rest of your life! Very satisfying and affordable technology is available NOW - there is no need to wait .... I would do it again in a heart beat !! You project onto a proper screen? Rus-Evo a écrit: You project onto a proper screen? YEP - a 104' screen that drops down from the ceiling and then covers my everyday use 52 inch TV with the two wall units either side of the TV. Once the "session" is finished, the screen just folds back on the ceiling out of sight, and the lounge becomes normal looking again! I'll have to post a picture so you can get a better idea Rus ! - these pics were taken about 4 years ago - I've modified things a bit since. 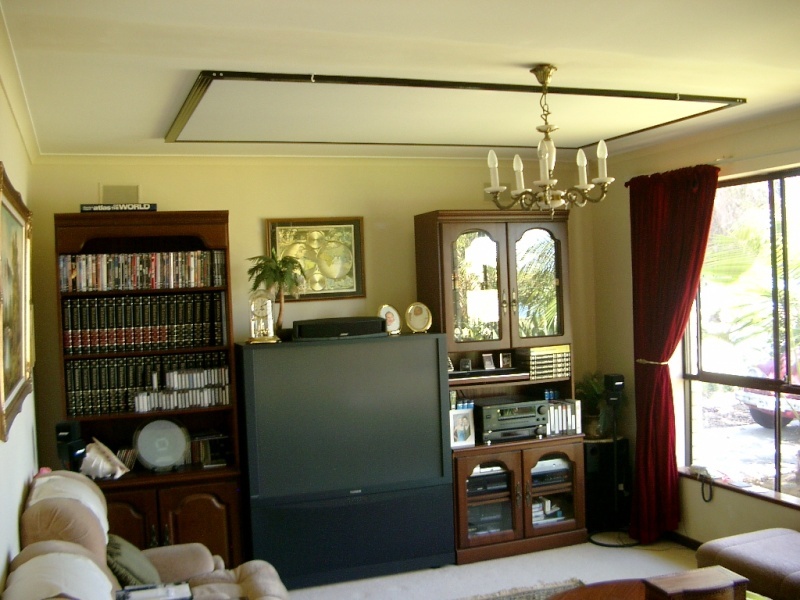 When I lower the screen, I have a black felt cloth the same size as the screen attached to the ceiling - this eliminates much of any ambient light reflecting back, off the white ceiling .... I'll have to post "an action screen pic next" !!! I would like to try gaming on one of those!! Rus-Evo a écrit: I would like to try gaming on one of those!! Rus - I just added some pics of my lounge set up in my previous post ..... will also try to add a real life screen "action" shot next - one or two with the projector working! Nice!!! What sound are you pumping out?